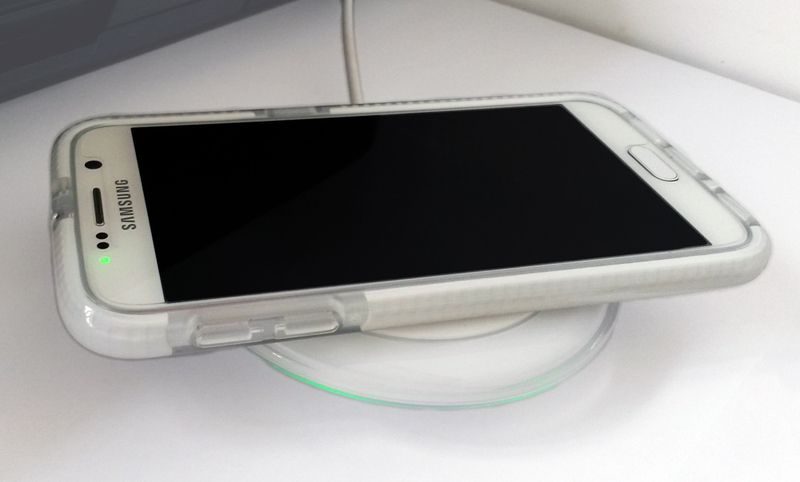 On Monday I reviewed Tech21’s case for the Galaxy S6. Even the best cases leave the screen vulnerable to scratches and dirt, so to fully protect your phone, you need a good screen protector. 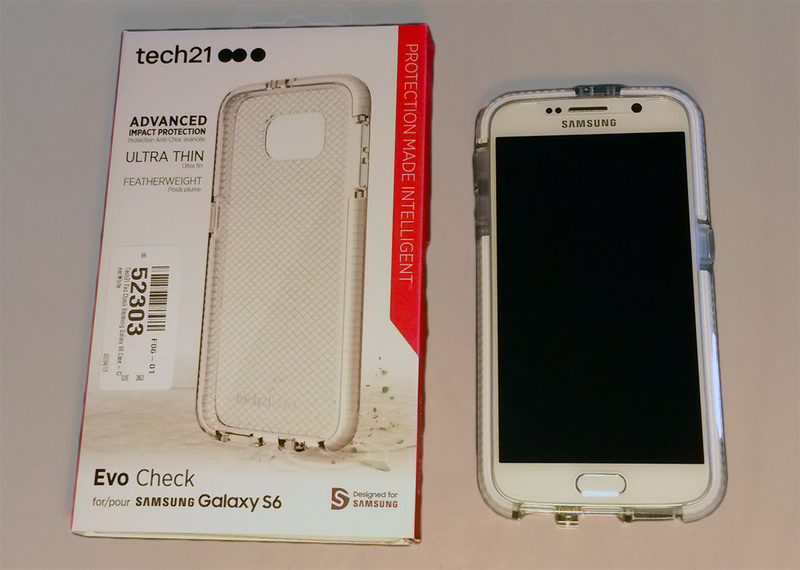 Today I’m going to review Tech21’s Impact Shield screen protector for the Galaxy S6. Our thanks to Mobile Fun who provided the protector for this review. Having use the Impact Shield screen protector for several years now, I’ve got a pretty good knowledge of the protection it gives. Whilst the screen protector itself does pick up scratches (which do very slowly fade with time) Tech21’s screen protector does a fantastic job of protecting the phone’s screen. Over the course of 2 years, I replaced my screen protector twice, because it just collected too many scratches, however every time I pealed it off, the phone screen itself was fine. This newer version offers the same protection, just for the S6. The video below is made by Tech21 – it’s a drop test of a ball-bearing from six foot. Tech21 have added a useful widget to the pack to help you apply the screen protector. This widget (very snugly) slots over your phone, helping you to line up the screen protector to exactly where it needs to be. Before you apply the screen protector you need to remove any dust from the screen. The microfibre cloth that comes in the packet is pretty bad, and just seemed to spread dust, rather than remove it. I ended up using a glasses cloth to give the screen a proper clean. Once all the dust is off, you remove one layer of the screen protector, stick it to the phone and then use the cardboard provided (also not very useful) to remove any bubbles, before removing the upper layer. Then you’re done; screen protector applied! There is no noticeable difference in the quality of the display once the screen protector has been applied. Some screen protectors make the screen look fuzzy or distorted, however Tech21’s does not. I have noticed that when using the screen with the protector applied, there is slightly more friction between my figure and the phone, meaning it doesn’t glide as smoothly across as it would otherwise. You do get used to it however. The Impact Shield screen protector currently costs £25, which is to the higher end of the price spectrum. The Impact Shield does its job well: protects the screen without compromising on clarity or usability. The level of protection it provides is great, but I’m not sure the regular user would really need it very often. The self-heal feature is good to have, but it doesn’t work quite as well as you might hope or expect. Ultimately taking into account the competition and Impact Shield’s relative price and protection, I’m going to rate it a generous 4 stars. 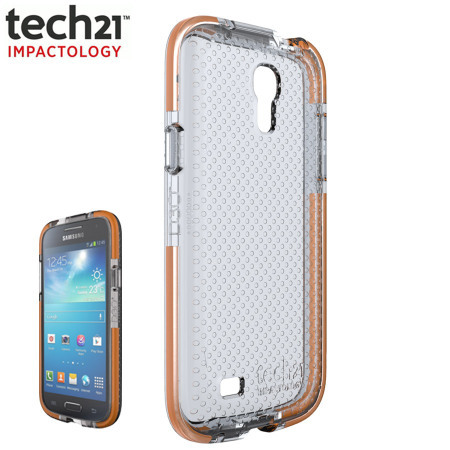 Two years ago I reviewed Tech21’s Impact Mesh case for the Galaxy S4 Mini. 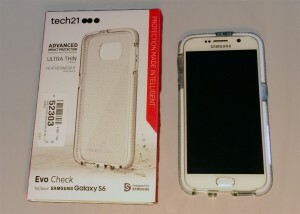 Tech21 are now using a new material called FlexShock, so having recently started using a Galaxy S6, I thought it would be appropriate to review Tech21’s latest Evo Check case for Samsung’s Galaxy S6. The main reason I use a case is to protect my device. Primarily from knocks and drops, but also from scratches, dirt and dust. The size of the S6 means that depending upon what you’re wearing, it wont always fit snugly in your pocket. This inevitably means that every so often it will fall out, at which point I will usually scrabble and scramble to try and catch it, but if I’m unsuccessful, I need to know the phone will be safe. The S6, with its Gorilla Glass and aluminium casing, seems to be pretty resilient by itself. It would appear you can use an S6 to crack walnuts open with no ill effects, and this drop test video demonstrates the S6 (Edge) is a pretty tough cookie. 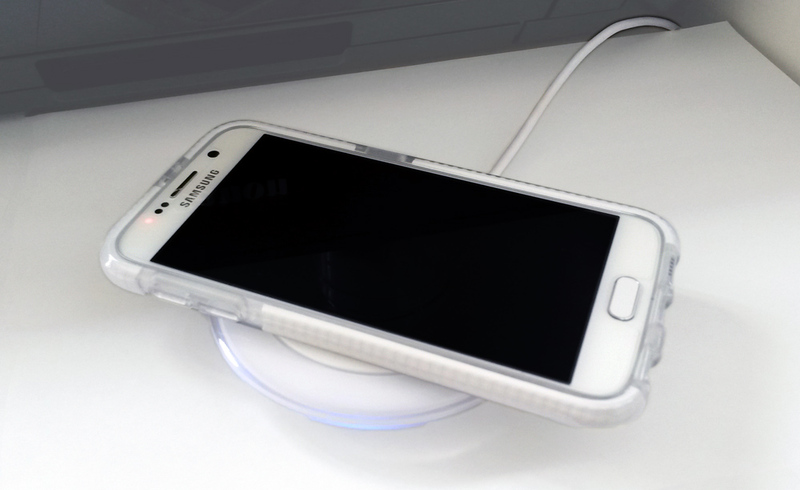 WARNING: for S6 owners, this is a heart-in-mouth kind of video! So how much protection does Tech21’s case provide? Well the answer is quite a lot. 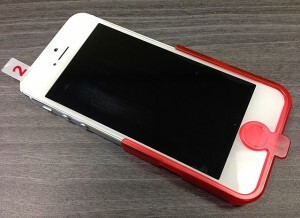 The case has a slight lip on the front meaning that even if dropped face down on a flat surface, neither the screen nor the home button would touch the ground – the case would absorb the impact. My main concern when I first looked at the S6 was that the rear camera protrudes, meaning that it would be the first thing to contact during an impact. The case has a slightly raised rim around the camera, meaning that the camera is now recessed by about 0.5mm – giving it some much needed protection. Tech21 have ditched the D3O which they had previously been famous for using, in favour of FlexShock. This new material they claim does the same job as D3O – absorbing the impact – whilst it can be moulded into better shock absorbing shapes and it can be dyed different colours. 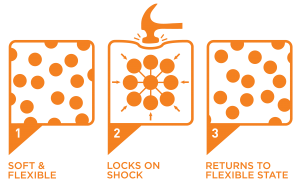 FlexShock seems just as hardy as D3O – but with added flexibility and customisation. I really like the metal and glass construct of the Galaxy S6, so for me it’s not about getting a snazzy case to conceal an ugly phone. The Evo Case is very minimalistic and whilst it does cover five sides of the phone (the top, both sides, the bottom and the back) it still gives the S6 a little room to showcase its looks. The beauty of FlexShock is that it can be styled in different colours. As such, I’ve gone for a smooth white, to match my white S6. It is obvious that I am using a case, and I have lost that plush glass feeling but as cases go, aesthetically the Evo Check does a pretty good job. A good case has to give clean access to all the phone’s ports and sensors. The Evo Check case does this well, there is ample room around the speaker, power port, lower microphone and the headphone socket. On the top the infrared sensor and higher microphone are also able to operate without interference. The camera has plenty of room around it, as does the flash, and you can use the heart rate monitor without removing the phone from the case. You do have to remove the phone to get to the SIM-card socket, but who does that on a regular basis anyway? The buttons (volume up/down and power) are covered, and to activate them you do need to press them firmly. I personally like this, as it gives the phone a quality feel and it prevents you from accidentally pressing them too. That said, (from watching endless YouTube reviews) I do know that some users would prefer the buttons to be uncovered, and dislike having to push them hard to get anything to happen. The Evo Check case is currently priced around £30, which is fairly mid-range (cheaper than many of Samsung’s own cases) considering (in terms of protection) it is a pretty high end product. 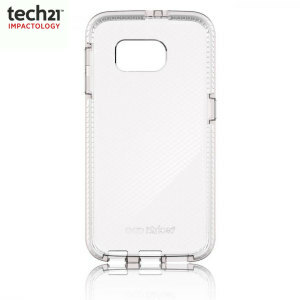 I’m a big fan of Tech21’s Evo Check case for the Galaxy S6. It covers the phone well, without obstructing any of the ports or sensors. It also looks great, even if it doesn’t feel as good as metal and glass. The protection it offers is hard to rival, especially amongst cases with a similar price tags, so I’m rating the Evo Case with FlexShock protection 4 and a half stars. Our thanks to Mobile Fun – the mobile accessories experts – for providing the case for this review. If you want to find out more or buy one of your own, check out Tech21’s S6 case on their website.